Final race of the season this weekend. Hope we will have a nice result. is anyone going to silverstone? ZEEWOLDE, September 9, 2010 - The final round of the 2010 Le Mans Series season will take place this weekend at the Silverstone circuit in Northamptonshire, United Kingdom. 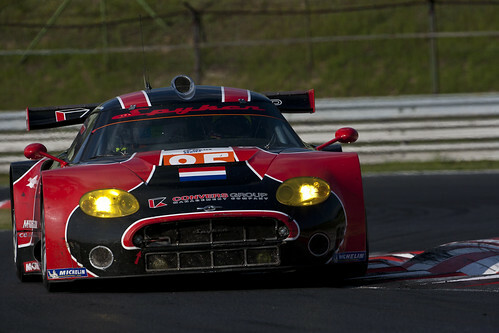 Spyker Squadron will again enter its Spyker C8 Laviolette GT2R for Peter Dumbreck and Tom Coronel. Spyker Squadron has good memories of the British Grand Prix circuit after taking a third place finish in 2007 and a second place in 2009. After finishes in all the Le Mans Series races this season as well as the 24 Hours of Le Mans the team hopes to end 2010 on a high. Peter van Erp, Managing Director: “We are on the eve of the final race of the Le Mans Series season. In the past three years we took a top four finish here at Silverstone, including a double podium finish. It will be an interesting race weekend because the series will use the new circuit layout - the Arena Layout - and this race is the first of three races for the Intercontinental Le Mans cup, which means there will be a large number of cars again. Of course we hope to get a good result to end the season on a high." Two free practice sessions are scheduled Friday afternoon at 13:15 and 17:00. On Saturday the team will have another practice session at 9:00 while qualifying for the GT cars starts at 13:10. The race itself will start at 11:55 on Sunday and will run over 170 laps or six hours. Eurosport and Eurosport 2 will be broadcasting live from Silverstone for over four hours. Spyker Squadron was founded in 2001 to underwrite the performance of the highly exclusive hand-build Spyker sports cars. Spyker Squadron is a dedicated team consisting of engineers, drivers and supporting personnel that develops, builds and supports the Spyker GT2 race cars. The team is based in Zeewolde, the Netherlands, where it has a high-tech workshop to support its operations. For more Spyker Squadron updates do not forget to drop by our VIMEO and TWITTER pages which we will be updating regularly. p5 now in qualifying looks good. P2 now woowwwwwwwwwwwww that's realy cool, that's looks good for the race. You didn't wait until the end of the practice session? in the race it will be better and hope for a top five. Fourth in final practice! Gap to first place just three tenths. Top 6 within half a second. Roll on quali!